LONDON, England (CNN) -- New research suggests penicillin is becoming obsolete, and antibiotic resistance could lead to a "major health crisis" unless governments act to promote research into new drugs. 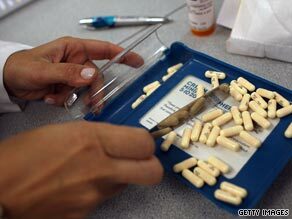 Over prescription of antibiotics means drugs including penicillin are becoming obsolete. Antibiotics such as penicillin have been key to the decline of infectious diseases over the last 60 years, but bacteria are becoming increasingly resistant to existing drugs. That means many antibiotics are no longer effective at combating common diseases, and a lack of research into new drugs means there is a dire shortage of alternatives, according to the report by London School of Economics and Political Science (LSE). Elias Mossialos, professor of health policy at LSE, led the research and has called for governments to do more to tackle the problem. He told CNN that penicillin is becoming obsolete in some developing countries, as well as in France, Spain and Romania, because of over-prescription by doctors and pharmacists. He said the emergence of "superbugs" such as methicillin-resistant staphylococcus aureus (MRSA) is causing the growing problem of hospital-acquired infections. "Antibiotic resistance is a much more important situation than swine flu and it will only get worse," he said. He said doctors are commonly misdiagnosing viral infections as bacterial infections, and then prescribing antibiotics to treat them, while in some countries pharmacists are selling antibiotics without a doctor's prescription. Excessive use of antibiotics encourages the emergence of resistant bacteria. Dr Kathleen Holloway of the World Health Organization (WHO) told CNN that antibiotic resistance is a global problem, with diseases including childhood pneumonia, dysentery and tuberculosis (TB) no longer responding to first-line antibiotics in some parts of the world. "We've got to a situation where there are no more drugs for certain conditions. There are some people with extreme drug-resistant TB and there are no drugs to treat them," Holloway said. "Research and development of new antibiotics isn't keeping up with development of resistance. If we don't do something about it we'll end up with a situation where all the old drugs have resistance and we don't have any new ones." Mossialos said the lack of development of new antibiotics is largely because antibiotics don't earn pharmaceutical companies as much as other products. That's partly because health policy tries to restrain the use of antibiotics, to avoid building up resistance, and partly because patients only need to use antibiotics for a short duration, typically 10 to 14 days, whereas patients take drugs for chronic diseases such as diabetes and heart disease for the rest of their lives. Mossialos told CNN that governments need to introduce incentives to encourage pharmaceutical companies to develop new antibiotics. His recommendations include governments developing an international fund that would invest in the early stages of antibiotic R&D, and guarantee sizeable orders for new antibiotics. Holloway agrees governments should help stimulate the development of new antibiotics and also stresses that more investment is needed to promote more prudent use of existing drugs. "In many countries it's not necessarily doctors who are prescribing, it's nurses, paramedical staff and unqualified staff," she said. "Governments need to invest more in providing continuing medical education and supervision for prescribers. "If we run out of antibiotics it's not just poor people with infections who will suffer, it's rich people who won't be able to have anti-cancer therapies or routine operations that rely on antibiotics."